Initial impressions always go a long way, and the site for EssayWriter.org is no exception really. The Essay Writer landing page is clean and tidy but spoiled by a pop-up which appears the second that you move from the page, blanks out the screen and demands your email address to get “a special offer.” That put us off straight away. If you go to a site looking for essays you should be left, in peace to peruse them at your leisure really. For a company that has been around for more than five years, this is odd.There was also a pop-up which wanted to send us notifications - again, annoying … it is mentioned in a review of Essay Writer too. Essay Writer emphasise three points on their landing page which they feel are the key things that their clients are looking for; full confidentiality, on-time delivery, and premium quality. They also claim a 98% success rate for their EssayWriter customer reviews; what they do not say is how that 98% is calculated. Any EssayWriter.org review should be treated with caution. Comments on EssayWriter note that they have 1,200 expert writers and specialists, and of those 50 are apparently the best writers in the educational essay sphere. They also imply that there are ten “support operators” at any one time to look after your needs. The range of products offered by Essay Writer is very comprehensive and covers any area that a student may need to use. This service emphasise the competence, quality and educational levels of both its writing and of its writers. 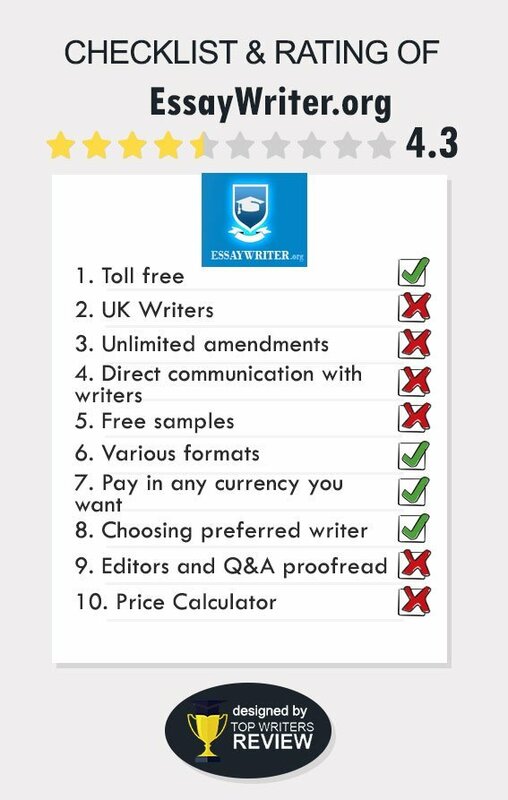 EssayWriter.org pricing is quite different from that of most essay writing companies. The pricing incorporates a system rather like a “Club Card” or supermarket loyalty scheme. Points, (money) are added each time you order, and this can be offset against future purchases. An undergraduate level essay of ten pages with a fourteen-day deadline would cost $180 without any discount applied. This is on the high side of the pricing scale. Payment can be made with all the usual credit cards, and, of course, by PayPal. The payment system is encrypted and secure although we could find nothing on the website which indicated how this is done or who is used. We can only assume that this is covered during the ordering process itself. All major currencies are accepted as payment, and a full refund is guaranteed should you not be happy with the service. Discounts by EssayWriter are complicated by the standards of the usual essay writing services. They are certainly not clear. They explain that on the first purchase, 10% of your cost goes into your bonus, “pot” and then with each subsequent order you get 5% and extra bonuses which are, "sometimes" thrown in. This is operated as a “bonus system” which give you rolling discounts by EssayWriter as you order papers and complete your payment for new ones. There are no obvious discounts published, so that is something to clarify with the customer services team. There are extra bonuses and discounts available as well, “from time to time,” but you do have to leave your email address to receive these discounts. We could find no coupon codes of this service. As far as we could see from the site, these are quite limited and not obviously advertised anywhere. There are two weeks of free revision offered on completed work. Any Essay Writer rating and their testimonials mention the quality of the essay service offered. We would not dispute that. We would question the lack of EssayWriter BBB, (Better Business Bureau) accreditation. We would also question the lack of freebies on the site given the prices are on the steeper side of the writing universe. The EssayWriter.org pros and cons really boil down to money. If you don’t mind paying top dollar for your essays, by all means splash out, but there is better worth to be had elsewhere. They seem to be a cheap last-minute resource where you go when don't care about quality but need something urgently. However, they appear rather pricey considering they won't even sneeze for you without any extra pay. I decided to work with this website as it looked reliable. I understood that the price offered to me was higher than average on the market and hoped it would mean higher quality. Not even close. The essay still had a lot of mistakes and typos and badly needed revision. Unfortunately, I didn`t have time for it and submitted without any changes. Surely, the grade was quite low. I liked their website though. I want to see a person who can call this place an academic success. As for me, it`s an academic failure! Moreover, an expensive one without much understanding of how a grading system in the US colleges actually work. I`d say it is too expensive for the quality provided. Besides, their support service is too slow and unresponsive, they always need to contact somebody before answering the question. Not recommended. Unbearable quality! That is not what I was paying for! Why do I have to experience all of these now and don`t even hear a word of apology from you?! It was impossible to reach them over the phone. Only during the third try I was able to get an answer via the e-mail. No wonder they aren`t capable of high literature paper works.